Of all the worlds depicted in Doctor Who since its modern revival, New Earth mightn't initially seem the most obvious choice for a dedicated spin-off series. Sure, the Tenth Doctor made port at this futuristic colony for the human race on multiple occasions during his televised tenure, but ask most fans where 2006-07 serials "New Earth" and "Gridlock" place in their all-time rankings of every episode transmitted to date and they're unlikely to station the pair alongside "City of Death", "Blink" or "The Tomb of the Cybermen". On the other hand, there's little denying the ripe narrative potential of further exploring a world whose corrupt hospitals and carnivorous underbelly - the only areas glimpsed on TV Who to date - are doubtless just the tip of the iceberg. Enter Tales of New Earth, Big Finish's latest addition to their ensemble of New Series sagas, which not only capitalizes upon that same potential by revealing new geographical facets of its titular setting aplenty, but goes one step further by following the continued journeys of recurring characters like Novice Hame, or in some cases their descendants. "Hold on - isn't this my story too? Mine and Thorn's?" "Of course. I'm trying to set the scene..."
The old saying goes that you should write what you know, an authorial adage which holds true for Roy Gill as he transports listeners back to the setting of both aforementioned on-screen New Earth adventures: the sprawling cityscape of New New York. Where - with the Doctor's help, of course - the capital's elevators once sprayed chemicals capable of healing even the most deeply infected hospital patients, they're now seemingly causing innocent civilians to vanish out of thin air, with Gill's script depicting newfound Senator Hame (Anna Hope) and orphan-turned-lift maintenance worker Devon Pryce (Kieran Hodgson)'s efforts to untangle this disturbing mystery. As premises go, it's a classic Doctor Who set-up for hidden alien machinations and some subtle allegorical strands surrounding societal outcasts, albeit without the Tenth Doctor's involvement in this case. Thankfully Hope and Hodgson are both more than capable of picking up the slack, their half-banterous, half-confrontational dynamic as two unlikely allies ensuring that no matter how much exposition we hear regarding New Earth's reformed political system and social strata, there's always a feisty wise-crack or compelling moral dilemma such as Devon's underlying prejudice towards Catkind waiting around the corner to keep proceedings entertaining. Credit must also go to director Helen Goldwyn and her immensely talented sound design team, whose work in rendering New Earth sans visuals does a superb job of painting the realm in our heads through the grinds and whirrs of elevator shafts, unyielding hovercars whizzing overhead at all times or distant yet heartbreaking explosions as events spiral to their crescendo. It's easy to take such atmospheric nuances for granted these days that Big Finish has almost 20 years of aural storytelling experience under its belt, but without such technical flourishes on Goldwyn's part, the listening experience would surely prove far less immersive than is the case with "Escape". In terms of twists and red herrings, there's not much to write home about beyond the intriguing introduction of a charitable benefactor-turned-self-proclaimed deity who comes to form the boxset's antagonist, an issue which becomes more problematic as the four stories progress. All the same, Gill - in tandem with Hope, Hodgson and Goldwyn - at least goes some way towards setting up a compelling status quo for the New Earth series here to justify its existence, imbuing Devon's journey in particular with hefty personal stakes and a driving motivation to undertake missions across the planet at Hame's bequest over the next three instalments. "Put the gun away! He didn't do this - his teeth are nowhere near big enough." Sadly the title of Roland Moore's sophomore entry doesn't mean we're in for an adrenaline-pumping horror set in Wiltshire's treetops - maybe next time, Big Finish? What we're offered instead with "Death in the New Forest", as the story's title suggests, is Devon's quest to investigate further schemes concocted by the villainous, faceless Lux Corporation while exploring New Earth's equivalent of our famed woodland. Here residents aren't so much going missing within elevator shifts as dying outright on the streets for all to see. In case that sounds like a rather dangerous conspiracy for Mr. Pryce to unfold, rest assured that he's not alone - both the Tenth Doctor and Vale, a sapling descendant of the Ninth Doctor's would-be flame Jabe ("The End of the World"), are on hand to lend assistance. Yet whereas "Escape" thrived thanks to its feisty lead stars' energetic interactions, "Death" suffers noticeably from the absence of that dynamic as Hodgson's left with carrying almost the full weight of proceedings alongside Yasmin Bannerman, who doesn't seem to know how to differentiate Vale from her ancestor without rendering her as a borderline dislikable rogue with whom the audience will struggle to fondly connect at any stage. Try as Hodgson might, then, he's inevitably unable to disguise the relatively predictable manner in which this second outing proceeds, from its warring alien societies to the Lux's attempts to utilize this conflict to its advantage to the inevitable last-minute counterplays which save the day. Naturally Doctor Who serials and their spin-offs can only throw so many science-fiction storylines our way without some degree of repetition eventually setting in - and indeed some academics argue that only 5-7 seven basic plots really exist in fiction - but that the well-worn wheels turning here become so plain to see makes for a rather deflating listen, since you're always longing for structural innovation which never comes. One area in which Hodgson, in particular, doesn't disappoint, however, is with his rendition of the Tenth Doctor. David Tennant's iconic incarnation of Theta Sigma always sported a lust for life and adventure as well as a rapid-fire mode of address which most narrators have since struggled to capture, yet close your eyes here and you'd almost struggle to tell the difference between his and Hodgson's takes on the characters. Indeed, while Jake Dudman has rightly been afforded the opportunity to play both the Tenth and Eleventh Doctors in Big Finish's dedicated Chronicles series given his marvellous impressions of both incarnations, this reviewer can only hope that if Tales performs strongly enough in sales terms to warrant a second season, then this beloved version of the eternal Time Lord - whose "song" is presumably close to ending at this point with not a companion in sight - will return for more New Earth-bound escapades, if only to give Hodgson further opportunities to showcase his utterly uncanny portrayal. "Here, the Bird People live in Nest City." If that tantalising quote alone isn't enough to get the listener's attention, then Big Finish might as well close up shop at this very second. Still here? Brilliant - in that case, prepare for a whirlwind tour of New Earth's highest recesses this time around as scribe Paul Morris unveils the vast aviaries and Solar Clouds populating New Earth's evidently chaotic skyline. Half of the appeal of a setting-focused boxset like Tales comes from each writer's opportunity to hone that most basic authorial skill of world-building, either crafting entirely new planets of their own or delving under the skin of those locales which their audience previously assumed that they knew all too well already. Whether we're meeting remarkably animate solar bears, learning how New Earth's upper atmosphere parallels that of our own global warming-ridden world or gaining further insight into how the planet's body Politik and fourth estate interacted, there's immense fun to be had here from diving headfirst into a setting which has only received 90 minutes of screentime in BBC One's flagship sci-fi drama to date. What's more, Morris affords Toby Hadoke - whose central role in the boxset is as the aforementioned Lux - the chance to flex his performing muscles further this time around, taking on other roles such as that of a Birdman to help better flesh out the communities which we explore and, as with "Skies", to ensure that we're sufficiently invested enough in these groups to care and fret as they naturally come under attack towards the hour's end. Even if Morris' various plot strands such as faked journalistic investigations, energy-harnessing Solar Clouds, and familiar environmental debates don't coalesce into anything particularly noteworthy as the Lux's latest plan comes to light, that we're still concerned as to the fates of the animal players pepped through this largely enjoyable penultimate episode does prevent it from feeling as downright unmemorable as its immediate predecessor. Again, though, with such a necessarily unsympathetic and emotionally devoid antagonist at the Lux at its core - one who lacks the chilling menace of, say, the similarly heartless Cybermen - comes a frustrating sense of deja vu, such that we're never caught much off-guard by its plans on account of knowing full well that the Corporation will manifest itself at some stage and try to cause a global calamity all the while. Every villainous entity has their respective tropes - hence why some fans such as this reviewer wouldn't mind seeing the back of frequent returnees like the Daleks from the TV show for a while right now - but perhaps the optimal approach here would've thus been to vary up the antagonists tasked with causing New Earth grief, rather than having most of Tales' relatively standalone storylines play out in near-identikit fashion. "In short, I am here to tell you how the Lux tried to destroy New Earth, and how it took my friend away from me." It’s off to the current desert residence of Catkind for Tales’ Season One finale, wherein the reunited Hame and Devon must race against time to stop – yes, you guessed it – the Lux Corporation hatching yet another plan to conquer New Earth. As with each episode preceding “The Cats of New Cairo”, listeners can expect plenty more of the same unreliably ruthless comrades, sudden betrayals, bodily possessions and quasi-wartime political metaphors for which the series will now almost certainly have become famous or infamous depending on your mileage with the boxset’s first three hours. Every Solar Cloud has a silver lining, however, and just as the Twelfth Doctor’s absence from all of Class Season One barring its premiere meant that he could no longer act as a last-minute deus ex machina to bail the Coal Hill School kids out of trouble, so too are the dynamic duo at this collection’s heart forced to resolve the present crisis alone without the Tenth Doctor's help, by any means – or indeed sacrifices – necessary. That decision on writer Matt Fitton’s part works to tremendous effect overall, thereby placing Hodgson and Hope’s electric dynamic centre-stage once more and putting both characters through the emotional ringer as the situation escalates and they’re both forced to contemplate how far they’ll go to protect their home. Trouble is, if the above set-up sounded as familiar as it should have based on our description, then there’s a good reason for that – focusing so adamantly on a singular, uninspiring antagonist means that regardless of the fascinating interplay between Hame and her increasingly desperate feline rivals which the Lux’s threat introduces here, we’re still left in little doubt as to how events will play out. At least Adjoa Andoh – better known to most fans as Martha Jones’ mother Francine in Who Season Three – goes all out as rival Sister Jara, the insatiable ferocity of whom lends her a certain wildcard feel and ups the stakes for Devon’s potentially limited lifespan, yet hardly enough so to take proceedings in a truly unexpected direction. Perhaps this reviewer doth protest too much at Tales from New Earth’s shortcomings, but given how innovative and tonally ambitious Big Finish’s recent productions like The War Master: Only the Good and their particularly audacious Torchwood range have been, to see this undeniably well-intentioned boxset take so few risks in terms of narrative structure, its range of monsters or rife potential for political commentary seems a major disappointment. Might the studio’s licensed New Series projects run the risk of oversaturation at this point, especially with so many spin-offs like The Churchill Years, The Time War, Jenny: The Doctor’s Daughter, UNIT, The Diary of River Song and Lady Christina planned for 2018? Possibly, though it’s too early to make such bold assumptions or to write New Earth off entirely; if the team goes back to the drawing board for Season Two to devise stronger arcs and antagonists, then there’s every chance that they could capitalise on the abundant potential teased by Season One’s superb lead performances and nuanced world-building. The final instalment of this unlinked trilogy of double bill releases sees the welcome return to Big Finish’s Doctor Who range of long-running audio companion Staff Nurse Thomas Hector Schofield otherwise known as Hex, played once again byPhilip Olivier. After a decade of regular appearances alongside Sylvester McCoy’s Doctor and Sophie Aldred as Ace, Hex was finally written out of the range in 2014’s Signs and Wonders. He returns alongside his two regular co-stars for two very enjoyable stories set during the early days of his travels before he started to become wise to the Seventh Doctor’s manipulative persona and the beginning of the story arc featuring the black and white TARDISes. Shadow Planet by AK Benedict finds Ace and Hex ignore the Doctor’s warning about visiting a seemingly innocent planet called Unity which they soon discover has recently been opened to visitors by a group of colonists who have developed psychic technology to separate shadows into separate personas. The Unity corporation is headed by Mrs Wheeler, played a great sinister edge by Belinda Lang. The supporting cast also includes the always excellent Nickolas Grace as Professor Grove and a well-judged performance from Sarah Thom as Mrs Wheeler’s long suffering PA Sandy who is also a central character to the plot as the revelations as to how the planet Unity was colonised are revealed. Aldred and Olivier also get to have fun by playing twisted shadow versions of themselves. Overall a very enjoyable opening two-parter which, in a similar fashion to Alien Heart / Dalek Soul, ends on a neat cliff-hanger which segues directly into the second story. World Apart by Scott Handcock continues directly from the end of the previous story with the TARDIS encountering a mysterious planet in the middle of the vortex. After landing and discovering that there is no else alive on the planet there is a nice two-hander scene between the Doctor and Ace which culminates in a shock for the Doctor when he learns that they are on a planet called Nirvana. It becomes apparent that they need to leave immediately, but having allowed Hex to go off on his own Ace refuses to leave him behind. Unfortunately, they are then too late getting back to the TARDIS which takes off with only the Doctor on board. Finding themselves stranded on this inhospitable planet provides some great two-handed scenes between Aldred and Olivier which shows just why they worked so well as a companion team and indicates that even now there is still potential to tell more stories featuring this pairing. Both stories featured in this release are very enjoyable with the second being one of the best of the six two-part stories that have featured over this trilogy, largely due its only featuring the three main characters throughout aside from a brief cameo in one scene. It is a credit to both authors that these stories fit so seamlessly into the existing canon of previous audio adventures, given that neither has previously written for this particular TARDIS team. 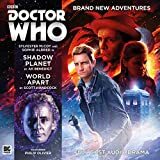 The Seventh Doctor and Ace are back alongside Melanie Bush for the next trilogy of releases which resumes the main range’s traditional four-part story format beginning with The High Price of Parking. For this year’s trilogy featuring the Fifth, Sixth and Seventh Doctors in successive releases, Big Finish have abandoned the tradition of three linked stories featuring different Doctors and instead adopted for an experimental change to their regular release format of a four-part story. Alien Heart / Dalek Soul is the first of three releases each fearing two stories told over two episodes, each by different authors. 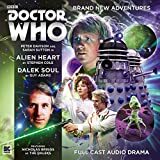 Alien Heart by Stephen Cole sees the Doctor and Nyssa arrive on the moon of the planet Traxana, having discovered that ten nearby planets have been mysteriously destroyed by an unknown device. The story takes the fairly-standard approach of separating the Doctor and Nyssa early on so they can interact with other characters. Nyssa ends up on the planet Traxana itself with one of the natives whilst the Doctor remains at the moon’s outpost station with the two investigating crew members. Naturally, the two strands eventually combine to allow the two travellers to be reunited at the stories climax only for there to be a somewhat unexpected cliffhanger. Whilst it may on first listening seem that having promised a stand-alone two-part story Big Finish have cheated a little by setting the scene for what follows, this is by no means a four-part story in disguise. Dalek Soul by Guy Adams picks up some time after the conclusion of the previous adventure. Nyssa is now on the planet Mojox, working as Chief Virologist to the Daleks and yet she can’t seem to quite recall how she and the Doctor ended up there. The Doctor, meanwhile appears to have undergone something of a personality transplant and is now working as a Dalek agent attempting to infiltrate a Mojoxalli resistance cell. This gives both Sarah Sutton and Peter Davison an excellent opportunity to play against their usual characters as both are given opportunities to show their more ruthless sides. As the clues to what has befallen both characters begin to assemble, this leads to one of the more memorable conclusions of Big Finish’s Doctor Who range and must certainly rank as one of Davison’s best performances on audio to date. Much credit to Adams, who has done great work on several of Big Finish’s other ranges including the Torchwood audios, for giving this well-established team such original material to work with. Having given the main range a welcome sense of reinvigoration, the next release will offer two new stories for the Sixth Doctor and Flip.